When the Laboratory of Archaeology was created by Dr. Charles Borden in 1949 and throughout the 1950s, LOA was located in the basement of the Mathematics Building. Initially LOA concentrated on teaching the archaeology of B.C. and the Old World to undergraduate and graduate students to the M.A. level. 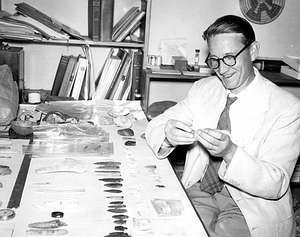 Dr. Borden undertook or directed about thirty excavations in British Columbia beginning in 1945 with funding provided by various agencies and individuals. These research projects and salvage excavations resulted in a collection of over 80,000 artifacts and samples that formed the beginning of a collection numbering about 500,000 objects today. By the 1960s, LOA occupied extra storage space in the UBC Power House. The organization of collections and records into systematic storage began in 1964 when Miss Moira Irvine became the first curatorial assistant. During the 1970s LOA acquired added laboratory and storage space in Brock Hall and the Department of Metallurgy and, with the addition of two professors, Richard Pearson and R.G. Matson, expanded its course offerings and began accepting PhD. students. Pearson specialized in the mesolithic, neolithic and later cultures in Eastern Asia and Oceania; Matson specialized in western North America, particularly the U.S. Southwest and southern B.C. In 1978, the faculty expanded again with the hiring of David Pokotylo, specialist in British Columbia archaeology. In 1976 the Museum of Anthropology (MOA) opened and the Laboratory of Archaeology moved some of its functions into space on the lower floor. The following year, the remaining facilities of LOA moved to the Anthropology and Sociology Building next to the Museum.